President Donald Trump speaks during a roundtable discussion on tax reform at Cleveland Public Auditorium and Conference Center in Cleveland, Ohio, Saturday, May 5, 2018. Trump, May 5: We have a lot of job openings. And people that weren’t hiring for years and years and years — all of a sudden, we have jobs. The increase in job openings is not “all of a sudden.” The number has been steadily increasing since the Great Recession ended in mid-2009. Job openings continued to decline in the first several months under Obama, reaching a low point of nearly 2.2 million in July 2009. The recession ended a month earlier in June 2009. But in the post-recession period, the number of job openings has increased at a pretty steady pace. It broke the 3 million mark in April 2010, the 4 million mark in October 2013, and the 5 million mark in January 2015. By April 2015, the number of job openings reached 5.62 million — the highest since BLS began publishing the data in December 2000. During Obama’s eight years, the number of job openings nearly doubled from 2.77 million in January 2009 to 5.44 million in January 2017, an increase of 96 percent. 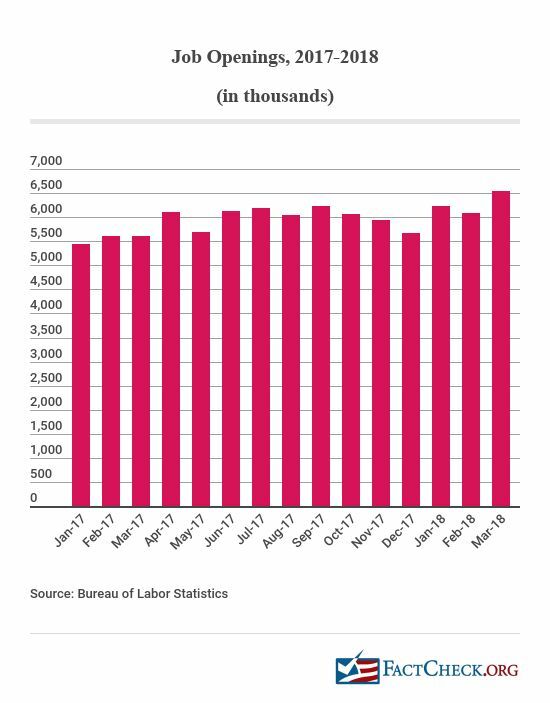 Under Trump, the number of job openings has continued to climb — breaking the 6 million mark in April 2017 and establishing a new high of 6.55 million in March, the most recent month available. That’s an increase of 20 percent under Trump. 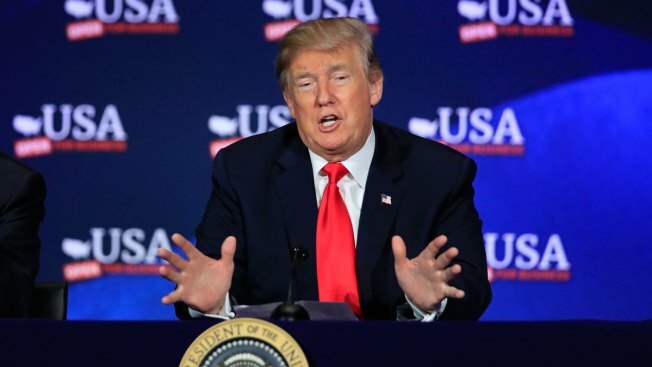 In Ohio, Trump said employers “weren’t hiring for years and years and years,” when in fact the unemployment rate was 4.8 percent when he took office — close to what economists consider “full employment.” And he said that “all of a sudden, we have jobs,” even though the number of job openings has been steadily increasing since mid-2009. It’s true that the job market has continued to improve under Trump. The unemployment rate, now at 3.9 percent, is the lowest it has been in nearly 18 years, and the number of job openings reached new heights. But the president disregards the facts when he claims these economic improvements have suddenly happened.